Josh and I hit up the Greek Food Festival for a couple of hours. This is a photo of the Pistachio Baklava and the Bogatsa I had to conclude my eats. 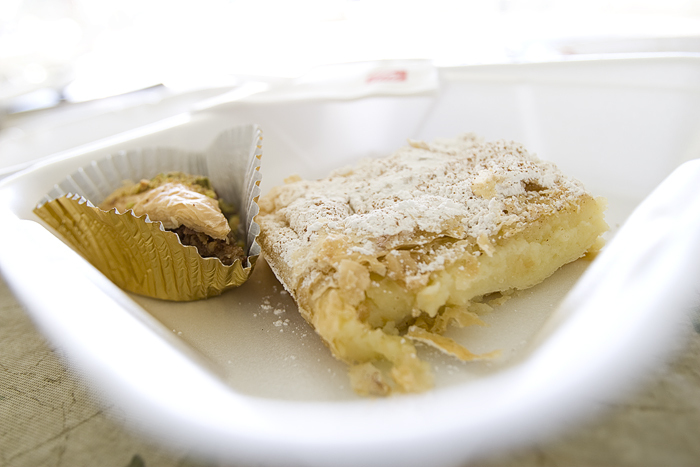 The Bogatsa was delicious (I love custard). I'd have to say the highlight for me was the trio of dolmathes that started my afternoon. Yum, yum, and yum! I also tried an Ouzorita (a margarita-style frozen drink made with Ouzo). The sun was pretty brutal at the time, so that Ouzorita hit the spot and gave me a few cases of head freeze. However, I'm not a big fan of the anis aftertaste that lingers a little too long.